A hunter is appointed to be the priest in his own village. He promises not to hunt any more. Even though he breaks his promise, he is allowed to stay in the parish. In 1951, he graduated from the Directing Department of Yerevan Theatre Institute (Levon Kalantar's master class). In 1950, Henrik Margaryanworked at Armenian Youth Communist Union. Since 1955, he worked at Armenfilm Studio. 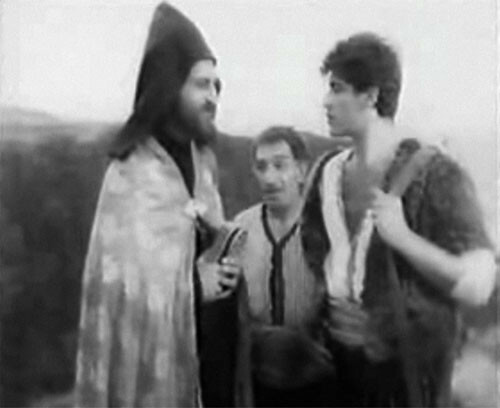 Yeghishe Charents (1957, doc. ), Generation of the Brave (1958, doc. ), The Last Farewell (1958, doc. ), The Guys of the Music Band (1960, Co-dir. : Henrik Malyan), Four in One (1963, short), Monsieur Jacques and Others (1964, segment “Priest's Promise”), Refugees (1968, short), Heat (1968, short), Shrove-tide (1968, short), The Clown (1969, short), Hard Rock (1974, Co-dir. : Albert Mkrtchyan), The Chairman of the Revolutionary Commitee (1977), Blue Lion (1979), Earth and Gold, (1984, Co-dir. : Arman Manaryan), The Pharmacy on the Crossroads (1987).